Avocado Oil, (Persea Gratissima), is cold pressed from the pulp of the avocado fruit. It's relatively thick with a light, nutty, earthy aroma. It's rich in vitamins A, B1, B2, B5, D, E with beta-carotene, minerals, proteins, lecithin and fatty acids. It's classified as a monounsaturated "vegetable" oil although it comes from the avocado fruit. 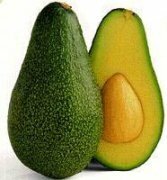 Avocado, Persea Americana, is pear shaped fruit grown in Central Mexico. It has a tough, scaly, dark green to purple colored flesh. It is often called the "alligator pear" by its appearance. Inside is a single hard seed. Unrefined oil differs in weight and color compared to refined oil. Unrefined oil is heavier and dark green in color. Refined oil is lighter and yellowish-green. Unrefined oil provides more health benefits than refined because it contains more of the avocado fruit. The shelf life of refined oil will last longer than unrefined. On average, shelf life is one year. It may become cloudy in cooler temperatures but return to normal in warmer temperatures. Avocado oil is used as a super fatting oil, (reducing lye allows extra oils to moisturize). This oil has a high percentage of unsaponifiables. The natural avocado components remain intact throughout the soap. They will not mix together with caustic lye. The full health benefits of avocado permeates throughout the soap. This means natural, healthier, skin, hair and scalp conditions! Refined oil soaps better because it has fewer unsaponifiables than unrefined oil. Unrefined oil is harder to find. Avocado Oil mildly cleanses, conditions and provides a creamy stable lather. This creamy lather, with very small bubbles, is moisturizing for skin. For fluffy lather, with big bubbles, add a lathering soap making oil like coconut or palm kernel. Avocado Oil, alone, will not produce fluffy, bubbly, lather. Use it in your homemade soap recipe for creamy texture. Some soap makers wouldn't make homemade soap without it. It's a favorite among base oils. Do not use this oil alone. Use with a base oil, like grape seed, coconut or palm. How much should you use? The range is broad. In bar soap use 3 - 13% or up to 30 - 45%! It's not a good idea to use more than 50% in your soap recipes. It can be used as a major portion for sensitive skin, but it's costly. Use a small percentage, around 8 - 10%. It's an exotic oil! Use for making expensive soaps, lotions, creams, lip balms or shampoos! Blend it with essential oils at trace with: Sweet Orange, Lemongrass, Geranium, Patchouli or Lemon. Combine with Shea Butter for a super rich formulation for dry skin. Mildly clean, Moisturize, Condition, Penetrate Deep, Regenerate Collagen and Soothe. Gentle enough for making baby soap or shaving soap. It is highly therapeutic, conditioning, healing, moisturizing, soothing and regenerating! Benefits dry flaky skin, sensitive skin, psoriasis, eczema, sun-damaged, age spots and scars. It penetrates, deeply, boost collagen production and smoothes skin.